Recommended: Could X particle solve two puzzles? Recommended: Life as we don't know it ... on Earth? Quantum fluctuations in science, space and society, from quarks to Hubble and Mars. Served up by Alan Boyle, msnbc.com science editor. E-mail Alan, or connect via Facebook or Twitter. Could X particle solve two puzzles? Life as we don't know it ... on Earth? 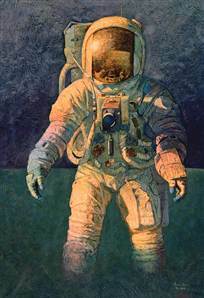 As a Navy test pilot and an astronaut, Alan Bean had plenty of the Right Stuff. But sometimes he sounds as if he wishes he had a little more of the Left Stuff. "A lot of things I think about come from the right side of my brain. And for most of the other guys, most of the things they think about come from the left side," the 75-year-old artist and one-time moonwalker told me. "And it got me in trouble at NASA at first." Bean retired from NASA long ago - but that other-side-of-the-brain perspective still comes through loud and clear, whether he's talking about the sullied image of the astronaut corps or his fears about the future of exploration. He may sound like an aw-shucks kind of guy, but he doesn't pull any punches. "I just say it how I think it, even though other people will say, 'That's weird,' because it's from the other side of the brain," he said. Our conversation, which took place just before Labor Day weekend, focused on the newly released documentary about the Apollo moon effort, "In the Shadow of the Moon." Bean was the fourth man to set foot on the lunar surface, during Apollo 12 in 1969, but in the movie he projects the folksy image you'd associate with your retired neighbor down the street. Only this neighbor happens to be one of only 12 earthlings who walked on another celestial body - and in case you ever somehow forget that, he's got a gallery full of paintings that focus on the otherworldly scenes he and his fellow astronauts saw close-up more than three decades ago. Felt to Walk on the Moon." That's the most overt manifestation of Bean's right brain at work - the artistic, emotional side that can sometimes clash with the analytical, serial-computing, checklist-marking activity on the left side of the brain. "To do art well, you've got to be kind of holistic and look at everything at once," Bean said. "It's different. You don't stay alive as an astronaut or a pilot looking at everything at once. You better be a serial kind of guy." Bean recalled that there were many times during NASA meetings when others thought his ideas were coming out of left field (or should that be right field?). He also wasn't the kind of guy whose ego could fill a room - which made him feel a bit out of place among all those Type A personalities. Even during our conversation, Bean would occasionally wait to hear what I had to say about a particular topic before weighing in. "What do you think?" he asked at one point. "You've got a better feel for the big picture than I do." Bean said the biggest message he drew from the Apollo experience in general, and from "In the Shadow of the Moon" in particular, was that people could achieve impossible dreams under the right conditions: "That is something, a message that needs to be said on a daily basis to kids. ... The 400,000 people that worked on Apollo ... are the luckiest people around, because they got a chance in their lifetime to work on an impossible dream. Most people never get the chance." Bean got steamed up over the claims of heavy alcohol use by the astronaut corps in the hours before flight, as I noted in a previous Cosmic Log posting. He acknowledged that not all astronauts are angels, as exemplified by Lisa Nowak love-triangle scandal. "Maybe the girl with the diaper was doing bad stuff," he said. "I don't know. But I do know about this other stuff. Nobody would ever do any of that." He voiced worries about NASA's plan to return to the moon - a plan that the agency's current administrator, Mike Griffin, has called "Apollo on steroids." Bean said he saw two main challenges ahead: "One, they're not going to get all the money we got. So how do you do it on not so much money? And the second thing is, how are you going to make it safer than the shuttle to go back to the moon? ... Already they've got a challenge that's, I think, bigger than Apollo right off the bat." Bean feared that Americans were becoming overly risk-averse, to the point that the political will to explore could be choked off: "If Apollo 13 happened nowadays, or that pad fire on Apollo 1, I don't know what the people in America would do. I don't know whether they'd say, 'Let's just give it up, it's too risky.'" "This is one thing about this movie that I think is nice, to let people see how optimistic people were and how they worked hard to make this dream come true. And it did come true. ... We can do those things today, but it isn't going to be easy. We're going to have Apollo fires, we're going to lose people. If you want to explore the cutting edge of what we know and what we can do, it's dangerous." "NASA opens new frontiers and creates new opportunities, and because of that is a critical driver of innovation. We don't just create new jobs, we create entirely new markets and possibilities for economic growth that didn't previously exist. This is the emerging space economy, an economy that is transforming our lives here on Earth in ways that are not yet fully understood or appreciated. It is not an economy in space - not yet. But space activities create products and markets that provide benefits right here on Earth, benefits that have arisen from our efforts to explore, understand, and utilize this new medium." Which argument holds more weight with you when it comes to putting a value on the space effort? Economics or exploration? Left brain or right brain? Of course, both factors come into play, plus the national prestige that comes with pushing the frontier. What will happen, for example, if China follows through on its own aspirations to send humans back to the moon? "I think the No. 1 thing that would help us, if we wanted to be in more of a hurry than we are, would be if China did something," Bean told me. But in the words of the moonwalker himself, "What do you think?" Feel free to add your comments below. Download the 30-minute audio interview with Apollo 12 moonwalker Alan Bean, plus a 30-minute chat with Apollo 11 moonwalker Buzz Aldrin. And stay tuned for an upcoming conversation with Harrison Schmitt, Apollo 17 scientist-astronaut and former U.S. senator. From the right brain of an attorney/space enthusiast/artist to you, I tip my hat, Mr. Bean. You've always been my favorite Apollo astronaut. Just wish you and Pete hadn't burned out your TV camera on the moon. I got my parents to buy a color TV just to watch you. I was so disappointed. But I love your paintings. I agree with steve smyth, only I would call it a dictatorship by comittee. Too many laws are passed that are not voted in by the people but rather by congress just to protect people to stupid or foolish to protect themselves. When one writes a letter to their congress "person" they just get a form letter back thanking them for their correspondence. One more "disaster" in the space program and I'm sure at least a few in congress will call for a halt! How true it is that this country has now become "it is to risky" a nation with not taking risks. We have to hand a big Thank You to the original 7 as they took the risks to "Push the Envelope" in exploration. Even Columbus pushed the evelope by sailing westard in search of a "New World"
Lets get back to realizing the Impossible Dreams as Mr. Bean calls it. Never fear folks. Space will be explored; maybe not for all the "noble" reasons, but when all other motivation fails, the profit motive will see us through. Whatever else Columbus may have been seeking, a shortcut to wealth was certainly a driving force. Americans will find a way to get to space and turn a profit even if they have to do it on the back of Chinese technology. Space consumerism has begun already. Private investment in space travel is increasing and the first consumers of "space for the fun of it" are lining up to pay. Scientists, artists, philosophers, gold-rushers, people running to something and those running from something, people looking to make a new life for themselves and those just looking to see what's over the next hill, politicians following the power and lawyers following the money...all will be able to buy their ticket in time. We're all just waiting for that critical mass of technology. But it won't happen through NASA which custom designs every flight. When private enterprise gets its hands on the technology and applies the power of mass-production, the rush will be on, and NASA can get back to what it does best...developing the X-15's of space travel. New lands were discovered by iron men in wooden ships, not wooden men in iron ships. It seems the only risks we are willing to take as a nation nowadays is war related (i.e. invading Iraq).... or energy related as we refuse to adapt to changing oil supply issues. I long for true vision in space exploration again, a willingness to face physical risk for the reality of eventually leaving this earth and expanding beyond the stars. I disagree with the common polemic that the USA has become too "risk averse." Hundreds of thousands risk our family finances and credit each year to start new businesses. Our federal government may become more risk averse, but this only opens markets and opportunities for the true American pioneers. Too many risks? How many people die on highways in car accidents every day? Do you hear people demanding that we stop building and driving cars? Everything in life, especially exploration, comes with a human risk. We need to continue space exploration, not because we are creating an economy of space-related products, but because exploration is what humans do. We didn't stop exploring our earth because there were shipwrecks. We shouldn't stop space exploration because there are spacecraft failures resulting in death. We need to keep exploring space because without exploration, humanity will stagnate. The political space race ended long ago. If we hadn't been so set on beating the Russians to the moon, we would still be figuring out how to get there. Space exploration in and of itself is a misnomer. It should be called Space Mining. Let's face it, true exploration will only take place if there's money to be made in doing it. I personally think the US government should get out of the space business and leave it to the business entrepreneurs to conquer space. If there's useful information to be gained and money to be made by conquering space, believe me, someone will figure how to do it. boy,if i was younger i would like to give being an astonaut a try.also,this country has taken a noun,sue,and turned it into a verb;too bad. Space travel keeps the wonder of life going forward. So much more to learn, to experience we must continue being creative, looking forward. Change is inevitable. If we don't go forward, we go backward! I say the government, private sector, etc. should explore everything possible. We are all too worried about our conveniences when we should be thinking of the big adventure. I know my life was better when I was learning new things and trying new things. Now I can't afford to learn and try new things because it cost too much and I have other people counting on me to assist them. Before the responsibility of others, I could spend my money on the fun stuff and that was exciting. Our children and grandchildren (and on and on) need something to be excited about. What better thing than what lies beyond. I say explore it all. Sure there will be tragedies but I would volunteer. I was 19 years old when I watched on TV the first walk on the moon. Since then the US has failed to use this great achievement to establish a base on the moon from which we could now be launching further exploration to the COSMOS. Instead, the US has wasted time and money on shuttles that have achieved little more than provide rides around the earth while the means to continue travels to the moon rotted away. Now we have to start all over again. But at least a return to the moon after 30 or more wasted years is coming to mind for some. I don't yet know if the return to the moon is just a political afterthought or a planned pursuit of NASA? Jim Seida Jim Seida is a senior multimedia editor at msnbc.com. Fourteen years ago, he helped create multimedia storytelling for an online audience as one of the core group of multimedia producers at msnbc.com. He thrives on field work and telling stories about people with video, still and audio gear.